I have always wanted to make cupcakes that looked the ones on the cover of Nigella Lawson’s book How to Be a Domestic Goddess. Although I do want to buy (and I will eventually!) the book, I scrounged around the net to see if I could find a recipe that would yield the same domestic-goddess-stepford-looking perfect cupcakes. And find it I did! On The Amateur Gourmet I found a recipe for Bizarro Burnt Butter Brown Sugar Cupcakes that seemed to fit the bill…especially since it was indeed taken from the Goddess Herself. It was quite a trip to actually “burn” the butter. It got alarmingly dark but it was supposed to so I didn’t panic. The cupcakes came out gorgeous! So cute like you wanted to take their picture and send it to your grandma. So I did. Take their picture that is…have yet to show Grannie. We had a lovely photo session with them posing and preening for the camera, not unlike Paris Hilton (or myself). I got their fab accessories (little flowers on top) from Cook’s Exchange at the Power Plant Mall. You can buy a bunch of these sugar flowers for a reasonable price, although they come in different sizes and colors per pack, and I only wanted smallish ones for the cupcakes, but hey, if I’m not patient or enterprising enough to make my own sugar flowers then I shouldn’t complain. I initially wanted to bake these solely because (oh the shame) they were cute. But they are in fact quite yum-yum-yummy! The burnt-butter-action really does something for the flavor…making it all nutty-butter-delish, a flavor that is also reflected in the icing (where you use burnt butter as well). It’s quite moist although my brother found the icing a tad too sweet…I, meanwhile, did not. These would be perfect for a tea party or baby shower, preferably accompanied by a pink or lilac twin set, kitten heels, and a strand of pearls. Congratulations on your maiden post! Cupcake looks terrific! Next time you are in Europe, pick up a small bottle of purple or pink candied violets and use those on your cupcakes to achieve Nigella domestic-goddess-hood nirvana! 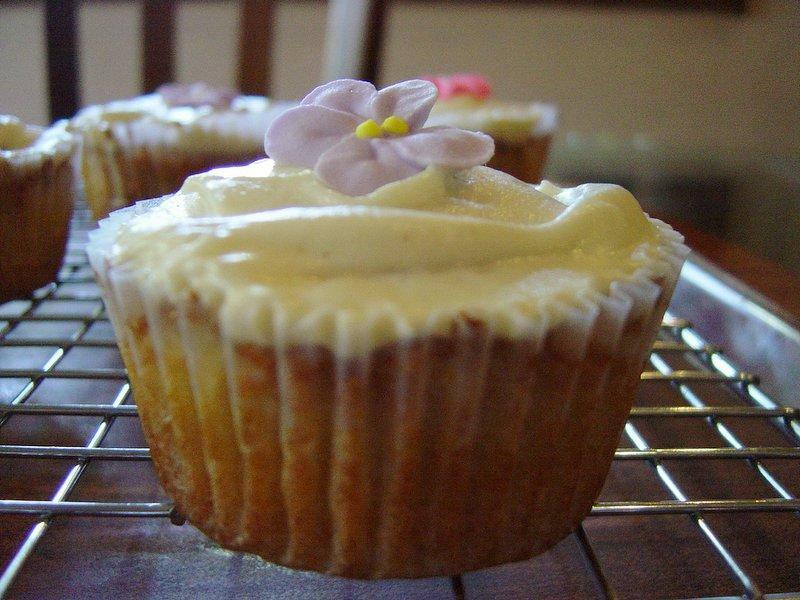 Enjoy your cupcake with a Pelligrino…good luck with the blog! Thanks Marketman! What a nice surprise to find I already have a comment…candied violets sound wonderful! Oh! Nigella’s burnt-butter cupcakes! I love baking those! Incidentally, there’s this gourmet shop in the basement of the Podium that carries lots of stuff. I’m not sure if they carry candied violets, but they had some candied rose petals last time I went there.